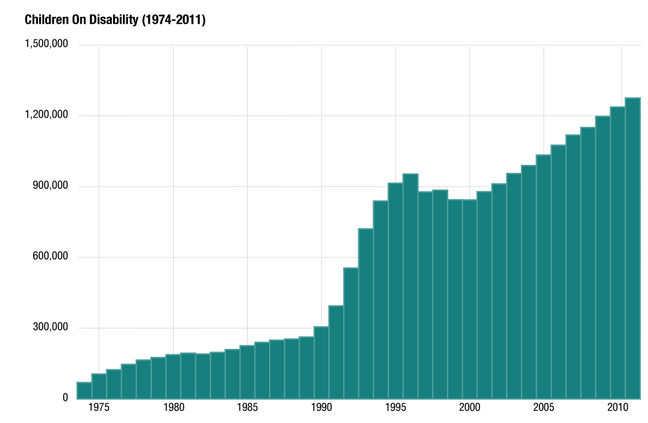 A NPR report "Unfit For Work" notes the startling rise in those on disability. Here are some interesting facts from the article. Every month 14 million Americans receive a disability check. In 1961 the leading cause of disability was heart disease and strokes, totaling 25.7% of cases. Back pain was 8.3% of cases. In 2011 the leading cause of disability was a hard to disprove back pain, totaling 33.8% of cases. The second leading cause was an equally difficult to disprove "mental illness" at 19.2%. Strokes and heart disease fell to 10.6%. 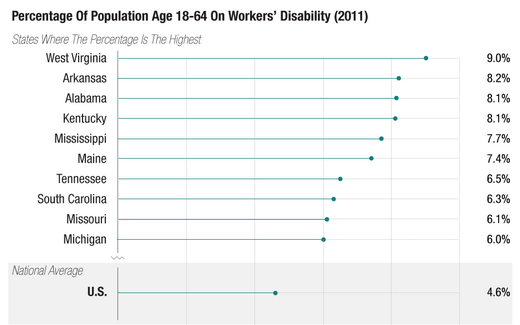 In West Virginia, a whopping 9% of the population collects disability checks. 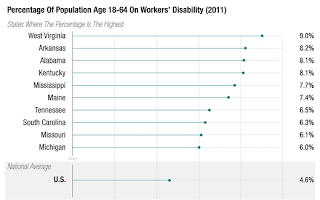 In Arkansas, 8.2% are on disability, and in Alabama and Kentucky, 8.1% collect disability. In Alaska, Hawaii, and Utah, the figure is 2.9%. In Hale County Alabama 1 in 4 receive disability checks. One thing nearly every case in Hale County Alabama has in common is Dr. Perry Timberlake who defines disability in a rather creative way. Those on Supplemental Security Income, a program for children and adults who are both poor and disabled is nearly seven times larger than 30 years ago. Once people go onto disability, they almost never go back to work. Fewer than 1 percent of those who were on the federal program for disabled workers at the beginning of 2011 have returned to the workforce. How Easy is it to Get Disability? Hale county's Dr. Timberlake asks a simple question to all his patients. "What grade did you finish?" If you claim "back pain" and do not have a degree, Timberlake believes you are disabled. Going on disability means you will not work, you will not get a raise, you will not get whatever meaning people get from work. Going on disability means, assuming you rely only on those disability payments, you will be poor for the rest of your life. That's the deal. And it's a deal 14 million Americans have signed up for. Disability has become a de facto welfare program for people without a lot of education or job skills. Joffe-Walt explains the special plight of kids. When you are an adult applying for disability you have to prove you cannot function in a "work-like setting." When you are a kid, a disability can be anything that prevents you from progressing in school. The disability program stands in opposition to every one of these aims. In 1996 Bill Clinton signed a welfare reform act, that he proclaimed to be the "End of Welfare As We Know It". It was. People moved off welfare on to even easier to get disability programs. Part of Clinton's welfare reform plan pushed states to get people on welfare into jobs, partly by making states pay a much larger share of welfare costs. The incentive "worked" using the term loosely. Welfare rolls shrank but disability rolls soared. A person on welfare costs a state money. That same resident on disability doesn't cost the state a cent, because the federal government covers the entire bill for people on disability. So states can save money by shifting people from welfare to disability. And the Public Consulting Group is glad to help. PCG is a private company that states pay to comb their welfare rolls and move as many people as possible onto disability. "What we're offering is to work to identify those folks who have the highest likelihood of meeting disability criteria," Pat Coakley, who runs PCG's Social Security Advocacy Management team, told me. "The high blood pressure, how long have you been taking medications for that?" one PCG employee asked over the phone the day I visited the company. "Can you think of anything else that's been bothering you and disabling you and preventing you from working?" The PCG agents help the potentially disabled fill out the Social Security disability application over the phone. And by help, I mean the agents actually do the filling out. There's a reason PCG goes to all this trouble. The company gets paid by the state every time it moves someone off of welfare and onto disability. In recent contract negotiations with Missouri, PCG asked for $2,300 per person. For Missouri, that's a deal -- every time someone goes on disability, it means Missouri no longer has to send them cash payments every month. For the nation as a whole, it means one more person added to the disability rolls. Who is making the case for the other side? Who is defending the government's decision to deny disability? And that in a nutshell explains soaring disability roles and massive fraud. 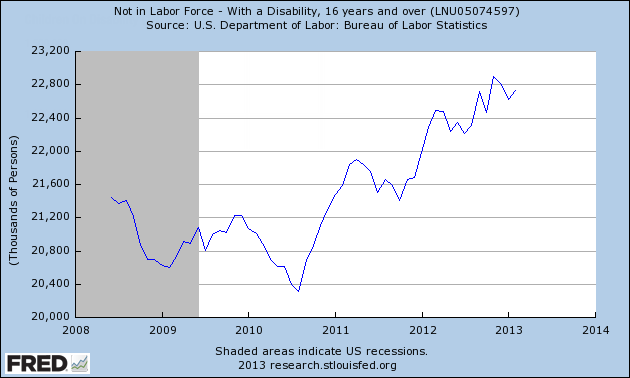 Disability fraud also makes a joke out of reported unemployment numbers. If you have a disability, you are no longer in the workforce. I would love to show data pre-recession. Unfortunately, the data only goes back to mid-2008. 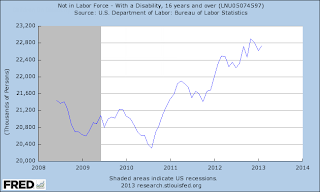 We can see however, that nearly 23 million Americans are not in the labor force because of "disabilities". I suggest "fraud" is more like it. Here's the curious thing: 14 million collect disability, but the BLS says 22.726 million are not in the labor force (not working), because of disabilities. What are the other 8.726 million doing? Is the BLS inflating disability numbers making the unemployment rate absurdly low, or are states doing that poor a job getting people off welfare and on to federal government disability programs? Some of both? Regardless, we need to stop this madness. One easy way to eliminate some of the fraud would be to put someone in charge of making a case for the other side. No, we do not need new Federal programs. All we need do is "Un-end Welfare as We Know It". If states had any incentive to stop disability fraud, we would not have so much of it. Make states responsible for a large portion of disability claims just as they are for welfare, and the number of people collecting disability will collapse. I have written many times about disability fraud, its relation to the unemployment rate, and its relation to expiring unemployment benefits. Inquiring minds may wish to consider some Disability Fraud Examples. I am hosting an economic conference on April 5 in Sonoma, California. Proceeds go to the Les Turner ALS Foundation (Lou Gehrig’s Disease). Please see My Wife Joanne Has Passed Away; Stop and Smell the Lilacs for my association with the disease.